From the luxurious Dolcevita collection, this timepiece offers soft yet angular lines for a finish that beautifully embodies strong, feminine elegance. Crafted in stainless steel with an intricate link bracelet, this stunning watch also features sapphire crystal glass, a sumptuous patterned cream dial, and blued steel hands and Roman numeral indices. 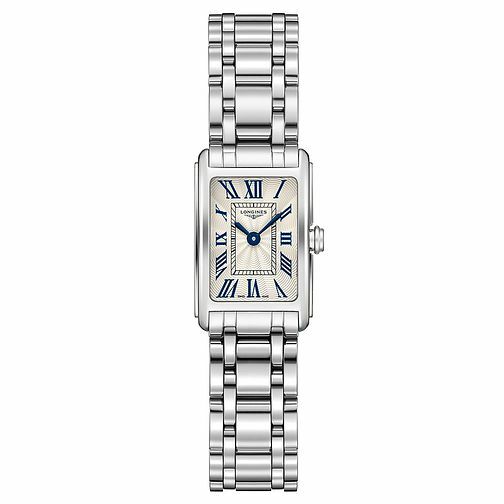 Longines DolceVita Ladies' Stainless Steel Bracelet Watch is rated 5.0 out of 5 by 3. Rated 5 out of 5 by Anonymous from Very stylish Lovely high quality timepiece. Very pleased with it. Rated 5 out of 5 by Anonymous from A timeless classic at at a great price. Stylish design, that would suit someone that likes classic designs that don't date. The square design with the white face with Roman numerals gives a sophisticated look. Ideal for evening and everyday use. My wife loves hers.